Ireland and Bangladesh became the ninth and tenth teams to qualify for the ICC Women’s World T20 2018, completing the line-up of the tournament which will be held in the West Indies from 9-24 November, 2018. Both teams qualified after winning their ICC Women’s World T20 Qualifier semi-finals, Ireland beating PNG – battling back after a tough start with the bat to post 113 runs for six before restricting their opponents effectively with the ball – while a strong start and finish to the innings helped Bangladesh post 125 runs for six, before, as so often, their spinners did the rest. Elsewhere, Netherlands continued their poor tournament, wasting a good start against Uganda to lose by six wickets, while Thailand recorded their first win of the Women’s WT20 Qualifier, bowling out UAE for 50 and chasing it down with seven wickets in hand. Ireland confirmed their qualification for the ICC Women’s World T20 with a convincing 27-run win over PNG at VRA. Opening for Ireland Clare Shillington and Cecilia Joyce, 1st Semi Final Ireland v PNG, VRA, 12th July 2018. The European side didn’t have it all their own way; they struggled early on with the bat, with the in-form Clare Shillington (0) dismissed from the game’s second ball, and four drops following in the next three overs, three off the unlucky Ravini Oa (0-10). 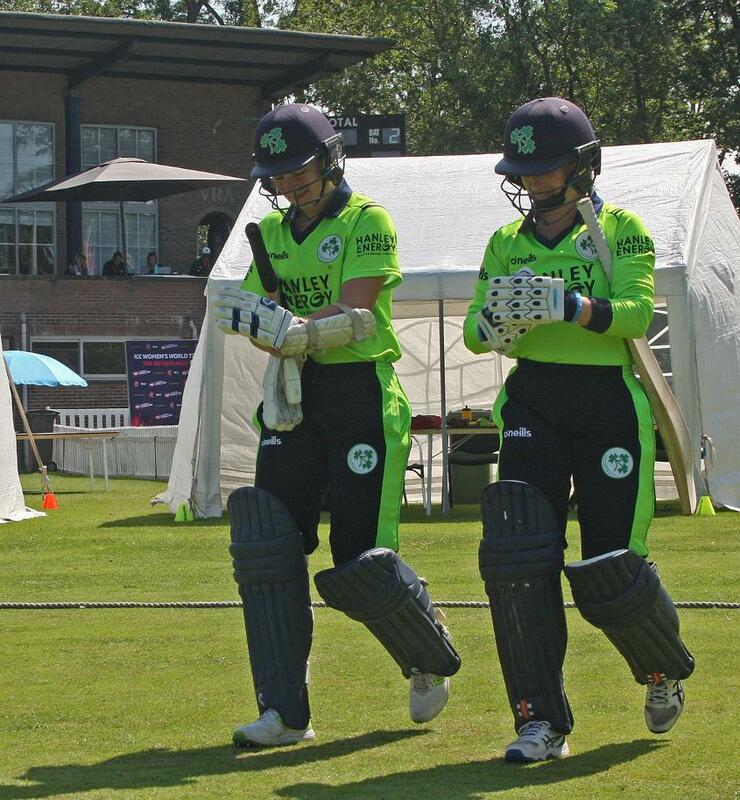 Ireland made the most of their luck through Gaby Lewis’ 33-ball 36 and Laura Delany’s gritty 30-ball 21 and managed to post a competitive 113 runs for six, with Vicky Araa’s 2 for 23 and Oa’s economical 0-10 from three overs serving to restrict them. PNG struggled in reply, only hitting two boundaries throughout their innings. They were eventually dismissed for 86 in the 20th over, Lucy O’Reilly finishing things off with her third wicket, while Laura Delany (2-13) and Eimear Richardson (2-22) were also impressive. Bangladesh became the 10th and final team to qualify for the Women’s World T20 with a thumping 49-run victory over Scotland. Celebrations after the win for Bangladesh, 2nd Semi-Final: Bangladesh Women v Scotland Women, VRA Ground, 12th July 2018. 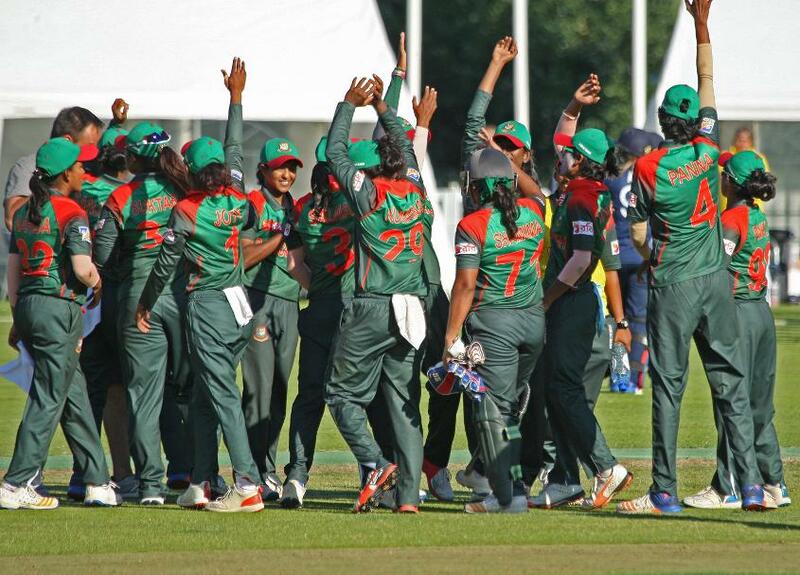 Batting first, Bangladesh made their way to a strong 125 for six thanks to an opening partnership of 51 between Shamima Sultana (22) and Ayasha Rahman (20) and a final burst from Nigar Sultana (31) as Bangladesh plundered 29 from the last three overs in the innings. In between, Scotland had done well to peg Bangladesh back, Priyanaz Chatterji’s 2-16 and Sarah Bryce’s two stumpings helping their side take 5-38 in eight overs through the middle of the innings. Scotland started slowly in their reply, but as the Bryce sisters added 43 runs for the second wicket, so their hope grew. The introduction of leg-spin however, as has so often been the case for Bangladesh, changed the game. Sarah Bryce was stumped for 31 off Fahima Khatun to spark a collapse of 6/14, two of those falling to player of the match Rumana Ahmed (2-10) and though Scotland battled hard to bat out their overs, their eventual 76-7 was 49 runs shy of Bangladesh’s total. Uganda confirmed their place in the fifth-place playoff final with a superb comeback win over hosts Netherlands, who have now lost all four of their games in the tournament so far. Uganda Batsman G Candiru plays a shot, 1st Play-off Semi-Final, ICC Women's World Twenty20 Qualifier at Utrecht, Jul 12th 2018. Their recovery began with the ball. Netherlands added 85 for the first wicket, with captain Heather Siegers particularly aggressive in making a 43-ball 46 and Sterre Kalis not far behind, finishing with 43 from 48 balls. But after the former fell in the 14th over, Netherlands could find the rope only once more in their innings, with Immaculate Nakisuuyi (1-13) bowling an economical four-over spell to tie them down. Netherlands’ 118 for three still looked a tough ask, and when Uganda slipped to 29 for two after seven overs, it seemed it might be more than enough. But once again Uganda rallied and once again Nakisuuyi was to the fore, wresting back momentum with a 28-ball 27. 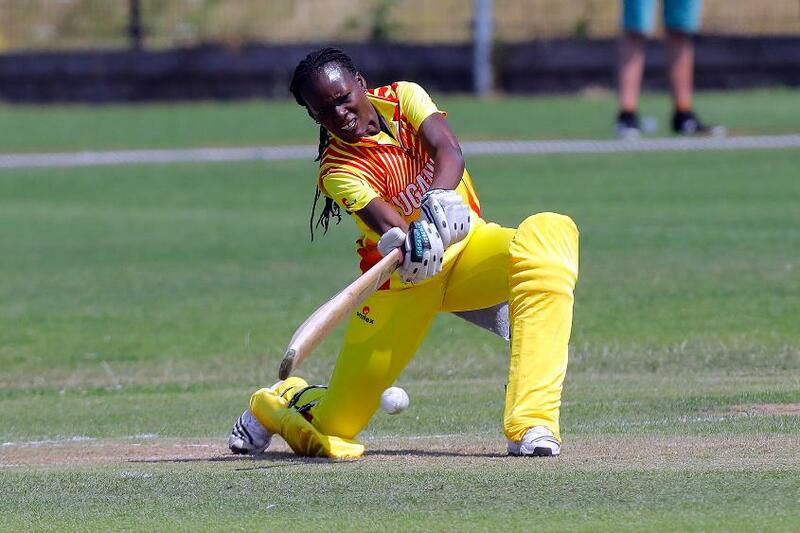 She fell with the job only two-thirds done, but Getrude Candiru held her nerve, finishing on an unbeaten, 42-ball 43 to see Uganda home with six wickets and nine balls to spare. 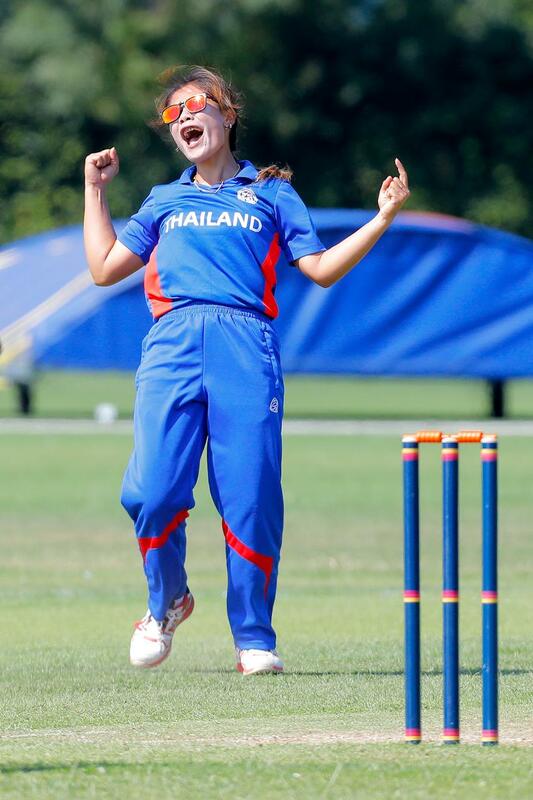 Thailand progressed to the fifth-place playoff final with a comprehensive seven-wicket win over UAE. Thailand bowler Sutthiruang celebratres the dismissal of UAE batsman Nisha Ali, 2nd Play-off Semi-Final, at Utrecht, Jul 12th 2018. The victory was set up in the field, with a superb team performance dismissing UAE for 50. There were three run outs, including two in one over, and miserly figures galore – only Ratanaporn Padunglerd, whose sole over cost seven, conceded more than four runs per over. Suleeporn Laomi (2-10) and Chanida Sutthiruang (2-7) claimed the pick of the figures, but this was a combined effort. Thailand made hard work of the reply, and after 10 overs were precariously placed on 28 runs for three, with Subha Srinivasan having claimed 2-15. The hard work they had done earlier paid off however, as captain Sornnarin Tippoch (14) and Nannapat Koncharoenkai added 23 to seal victory with 4.3 overs to spare. Remarkably, not a single boundary was hit across either innings. 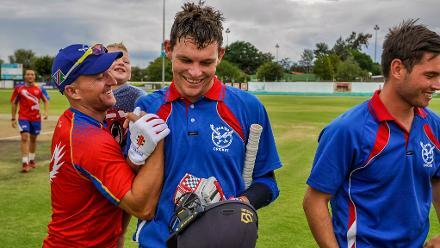 Saturday’s fixtures between Netherlands and the UAE has been moved to a start time of 10:00 local time, followed by Uganda against Thailand which has been moved to 14:00 local time at VRA Cricket Ground, Amstelveen. The 3rd/4th place play-off and the Final at Kampong, Utrecht start times will remain at 12:00 and 16:00 local respectively.